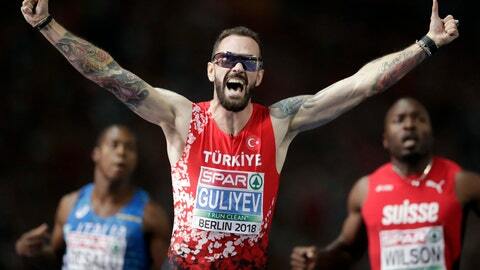 BERLIN (AP) — World champion Ramil Guliyev won the men’s 200 meters at the European Athletics Championships on Thursday, and Elvira Herman of Belarus denied German hopes of gold in the women’s 100-meter hurdles. Turkey’s Guliyev set a championship record of 19.76 seconds in beating Britain’s Nethaneel Mitchell-Blake and Switzerland’s Alex Wilson. The 21-year-old Herman clocked 12.67 seconds to beat Olympic bronze medalist Pamela Dutkiewicz (12.72) and Cindy Roleder (12.77) – both of Germany – for her first medal at a major meet. Olympic champion Thomas Roehler won gold in front of home supporters in the javelin with a throw of 89.47 meters, beating German compatriot Andreas Hofmann and Estonia’s Magnus Kirt. World champion Johannes Vetter finished fifth. World champion Karsten Warholm of Norway won the men’s 400-meter hurdles in 47.64, ahead of Turkey’s Yasmani Copello and Ireland’s Thomas Barr. France’s two-time Olympic silver medalist, Mahiedine Mekhissi-Benabbad, won his fifth European gold overall with his fourth 3,000 steeplechase title. Also, Greece’s world and Olympic pole vault champion Ekaterini Stefanidi successfully defended her European title against compatriot Nikoleta Kiriakopoulou and Britain’s Holly Bradshaw.